iLounge noted yesterday that Apple has begun selling gift cards specifically for its iBookstore, offering convenient $25 and $50 options for gift givers. 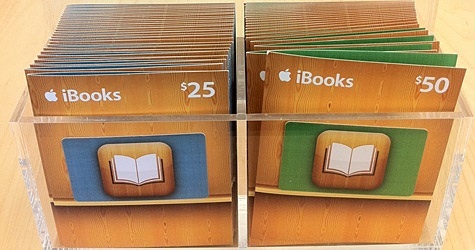 While existing iTunes Store gift cards can reportedly be used in the iBookstore, the new iBooks-specific cards offer a new option for those looking to focus their gifts on books as opposed to other iTunes Store content. Based on an Apple Support Discussions thread from earlier in the year, it appears as though users were able to purchase standard iTunes Gift Cards for use in the iBookstore; the new cards remove any ambiguity customers may have had about whether or not an iTunes GC would be usable in the iBookstore, and will likely be popular add-ons to those purchasing iPads as a gift. The report notes that the new gift cards are available in Apple's retail stores, but we have also seen them in our local Target store. Update: To clarify since there has been a bit of confusion in our forums, the new iBooks gift cards are the same as the existing iTunes Store gift cards, allowing users to purchase any iTunes Store, App Store, or iBookstore content they desire. But the new option allows gift givers to place an emphasis on giving the gift of books rather than just offering the recipient a iTunes Store gift card. Apple has similarly offered App Store gift cards, which also offer access to all content, for some time.